The hospitality industry is changing – rapidly. Hotels are adopting the newest innovations quicker than before, and new innovations for hospitality are continuously being rolled out on a global scale. Nowadays, hotels have to make the choice to either take the leap and innovate, or to be left behind. The 4Suites team went to several exhibitions this year and has been following the market developments closely, gaining valuable insights on trends. 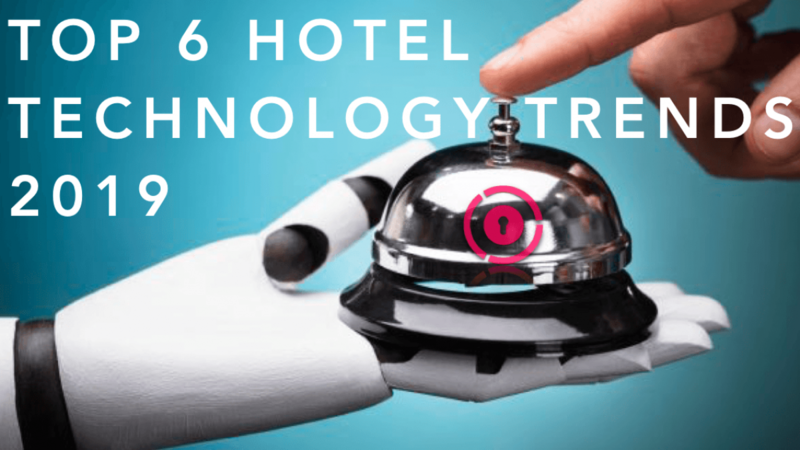 In this article, you will find the top 6 hotel technology trends of 2019. The cloud has been one of the most important hospitality trends for a few years now. Lots of companies are ‘joining the cloud’ with their newest innovations for a reason. Cloud-based technology is real time, barely fails and it can connect and integrate with a broad range of other software and hardware solutions. Hotels which are shifting to cloud-based solutions are able to see a big rise in productivity. Simplicity and speed are still very relevant; guests are starting to demand a smarter hotel with mobile solutions included, because they’re getting used to the ease of mobile technology. This is why many companies are starting to focus on the mobile aspect for hospitality. At 4Suites, we integrate with PMS systems (property management systems) such as Mews and Clock. Because we’re connecting PMS systems as well as apps and even locks to our cloud platform, we’re giving hotels the possibility to offer their guests a seamless guest experience – fully automated, from making a booking to opening rooms with a smartphone to checking out by using a branded app. Because of the cloud technology, branded web-based apps from Criton with the 4Suites mobile key integrated are also a possibility if hotels don’t want their guests to download an app. To conclude: the cloud opens up a broad range of possibilities and provides connectivity and flexibility. Optimizing the journey by implementing cloud solutions can result in more available working hours for the hotel staff and in a dramatically improved guest journey. Interested in how our Cloud/IoT platform for access is revolutionizing hospitality? Check out our platform and the lab! Full cloud solutions provide connectivity, and ultimately can result in an internet of things (IoT) environment. IoT involves connecting everyday objects to the internet, like lighting, air conditioning, radio, TV or even coffee machines and so on. Connecting these devices makes analog unintelligent devices ‘smart’, interacting over the internet and generating data. IoT solutions can connect with the cloud mentioned before. The cloud makes it possible to connect, and an IoT-environment with connected devices and other smart solutions could be the result. This is why we’ve split these trends. IoT solutions are rolling out fast in the hospitality industry, making hospitality smarter every year. Nowadays, interaction is becoming increasingly important. Guests expect to interact with hospitality companies on a broad range of channels, expecting fast responses as well. Making sure all of these channels are setup right, missing not a single message and being able to respond rapidly on all these channels can be a challenge. This is why chatbots & AI are starting to appear more and more in hospitality. Chatbots can provide instant answers on simple requests, saving up tons of hours for the service staff and improving the guest journey. Chatbots are a trend since 2018, and especially in hospitality this saves up tons of time and money instead of employing 24/7 service staff. The state of chatbots 2018 concludes that 69% of consumers prefer talking with chatbots, providing them with instant information and answers. AI will be necessary to fully personalize the entire service on larger scales. Big data has been around for some time already, but it still classifies for a hospitality trend in 2019. Big data still isn’t used on a large scale in hospitality, but it can greatly improve the guest experiences provided. Big data can be used to offer recommendations to guests on a large scale (restaurants, other hotels, facilities, food and much more). Hotels can also use big data to find out what the trends are for their specific property or city. With this information, hotels are able to enhance a broad range of services for their hotels and to try out new strategies based on the data. The robot completely replaces front-desk employees, ‘automating’ the process. Well, the process gets automated for the hotel which saves up greatly on costs, but it doesn’t get automated for the guest in this case. Robots can be equipped with AI and chat functionalities and make use of big data while being connected to the cloud – making use of every hospitality tech trend around. Not a tech trend to underestimate! Biometrics and technology which makes it possible to recognize people is again a general trend, also making its entry in hospitality. Biometrics can make seamless authentications possible, which can greatly benefit hotels and guests alike. Facial recognition, finger prints and more can become great ways of identifying guests, speeding up the check-in. Also, it can be used to unlock rooms, for payment and for checking out. Biometrics can eventually become an all-in-one technology, optimizing entire guest journeys and speeding up tons of processes. Interested in what our technologies can do for you? Feel free to contact us. Want to stay up to date? Follow us on LinkedIn and Facebook!